Epic Man is a popular perfume by Amouage for men and was released in 2009. The scent is spicy-woody. Projection and longevity are above-average. It is still in production. Masculine, classy, wonderfull perfume. Starts with pepper and incense as the strongest notes and after a while woods and smoke come in play. My wife liked it! I wish it had better performance on my skin, the longevity is moderate on me. This will be my fourth comment, let's see if I can make it less disheartening this time. I don't own Epic Man, but I've bought some bottlings in the souk over the last few days. The others from Amouage are still waiting for their test on my skin and I wouldn't be surprised if a fragrance of it would remain as a purchase candidate. I usually already sniff the atomizers when the scents arrive, often there is already a lot to smell and the Amouages make me all together very curious. Epic will probably not be a serious buyer, although I like the fragrance very much. It is masculine, expressive, peculiar and pleasing, but the prelude ensures that I will not love this fragrance. I have planned to add to my small collection only what convinces me 100%, so to speak starts up and in the course not worse, but at most becomes better. Directly after spraying Epic Man develops a piercing medical note in my nose, so really not good at all. In this respect I can understand Above's comment on it. Fortunately, it may only take 5 minutes (no stopwatch in use) to get comfortable. If what is now happening would last longer with me, I would be completely thrilled. I find it difficult to name the individual scent components as others here are able to, but of course the incense is clear, I smell woods and also the oud is already present. Very tasty, very strong, spicy and made for a self-confident wearer. Exactly such a thing is missing in my collection, which is rather located in the fresh area. Unfortunately it is already over after another hour. I have noticed that fragrances often do not stick to my skin for so long, maybe this has something to do with it. The durability in general of Epic Man is good no question, but what comes to me after this best phase is significantly weakened. Here I see the oud before the incense. Still a very pleasant fragrance, but in this phase, which lasts for hours until the end, other candidates convinced me more, e.g. Oud from Reminiscence. The latter I found only too feminine, but after wearing it several times I can imagine it very often on me. All in all, Epic Man makes too much noise for me at the beginning, then I listen to a wonderful story, which unfortunately turns out to be a short story and finally the report just splashes to me. Journey with Asia Oriental Express started in Bangkok. The composition of luxury cruised around Thailand, Laos and Cambodia, visiting a few holy places. Grizzled Mr. M., obviously accustomed to luxury, sit frivolously in leather chair of observation car at the end of the composition. While drinking Bombay Sapphire gin tonic with quinine he thoughtfully watched the unreal landscape passing by. Beneath white flax shirt and dark blue jacket Epic evaporated. Epic, the liquid of Asian wealth hidden in jade green bottle. Regal oud and incense, liven up by squeezed saffron and prickly pepper perfectly matched the breath taking landscape. Leather and animalic notes perfidiously reminded nothing is perfect what it seems like. The idyll was interrupted by a waiter's question: "Sir, a souffle maybe?" Sir just coolly answered: "If I have to..."
Epic opens with slightly green notes, perhaps due to myrtle. Quickly you can smell the notes of frankincense and pepper, that last for a long time. Arise in the drydown, very harmonious, notes of oud, leather and musk, with a hint of incense. The combination works very well, making this scent into something unique and truly epic. Two sprays are sufficient for the whole day. Any meal with more than two courses isn't about satisfying hunger, it's about having an experience. I, an American, am fond of the three-course meal, experience-lite. I see the value in a multi-course meal, but I won't go so far as to have a ten-course Titanic dinner, or a twenty one-course Versailles bacchanalia. To my mind, a classic five-course dinner is the height of luxury. Amouage have been known to imitate French style. God knows they have made a few ten-course perfumes. Epic man is their five course meal. It is the perfect middle ground between opulent and edited. Even the choral top notes tell you that there is an emphasis on bass: amber, frankincense, oud, tea. Tea? In a smart twist, Amouage do in fact include a tea-like note in Epic Man. It's the perfect modifier to the five course perfume, it enhances the smoky and aromatic qualities of the other basenotes without adding additional weight, or, stretching the analogy, a few more courses. I tend to berate Amouage for their tedious male/female perfume releases, and I think they deserve it. Please, let’s spare perfume the his/hers baggage. Perfume at its abstract heart defies gender, and in specific, Epic Man raises gender neutrality to a peak by combining fine ingredients and the best of both eastern and western traditions in the service of simply making a beautiful fragrance. The resulting hybrid treats gender as it does ethnic culture. It acknowledges it at the same time that it refuses to be encumbered by it. Epic Man is a reminder to ignore the marketing and smell the perfume. If we must have a gender pairing, Epic Man should more likely be paired with Jubilation 25 for women. Both are the perfect examples Amouage’s stated mission to pair eastern materials and sensibilities with classical French perfumery. It's no wonder that Epic Man smells first and foremost like success. I LOVE this fragrance so much! The pepper and incense seem to be the most dominant ingredients with the woods being the secondary elements. It's slightly sweet and slightly powdery as well. Sillage and Longevity are tremendous and I can smell it on myself for many hours without becoming anosmic to it. Two or three sprays is all you need. Expect a minimum of 10-12 hours out of it. 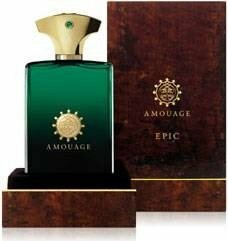 Amouage seems to be hit or miss in their releases to me and while some may think Jubilation is their crowning achievement, in my opinion, Epic Man is their masterpiece. The only drawback to Epic Man is the price. I realize that $290 for a 100ml does seem to be a bit crazy but on the plus side, it will take a very long time to use the bottle up. Is it worth it? To me, it is. I've spent quite a bit of money on other things that I enjoyed far less. Would I rebuy? Without question, yes. Epic Man will always have a welcome place in my collection. I get a tremendous blast of pink pepper to open things up (quite similar in this regard to the newer Honour Man, also by Amouage). The pepper hangs around, mixing with other spices and frankincense and just a hair of citrus. I get some patchouli, castoreum and musk in the base, primarily. This is unbelievably strong stuff as others have mentioned, and it lasts for what seems like forever on me (at least 12 hours so far, and no end in sight). Projection and sillage also seem quite strong, requiring the wearer to go very easy on the trigger. All in all a good scent that is recommended, but Amouage offers many better ones for your dollars than this 3 out of 5 star entrant, IMO. It's from Amouage, so it's undoubtedly wonderful stuff, with all the strength and longevity I enjoy in a perfume. But to be frank, it's simply not the way I want to smell, nor does it project the sort of personal image I believe I could pull off, nor want to pull off. Others have said that it's macho, and while that might not be quite the right term, I suspect "distinguished" fits the bill, and as a lighter-hearted older guy, I'm simply not interested in ever seeming this distinguished. Perhaps the sort of thing to wear if you are an established politician stepping out of your Rolls Royce, but carrying with it the same sort of air of high-powered unapproachability that such mindfully-serious men often project. I find it terrifically conservative, and probably not worn by sort of man you might initially consider fun to pal around with. But exactly the sort of thing to wear if you find yourself in a situation where that's the image you need to project, and probably the perfect stuff to wear if you should find yourself in the position of, say, needing to make an advantageous business deal with a bunch of stone-faced Soviets. So not the greatest date frag, unless you happen to be into those sorts of women, that is. This perfume has an amount of darkness, a pint of smoke, some quantity of incense, five spoons of spices and a bit of oud. Perfect recipe! The best Amouage for man, after Jubilation XXV.